Jinder Mahal won a six-pack challenge match to become the top contender for the WWE title. Other matches also had title implications as Charlotte earned a shot at the women's title after defeating the champion, Naomi, in a non-title match. Setting up another title program, AJ Styles defeated Baron Corbin by count-out to seemingly ensure he is the next challenger for the US title. Meanwhile, US Champion Kevin Owens continues to proclaim himself as the "Face of America" in his new role on SmackDown. The show opened with a memorial graphic honoring Matthew "Rosey" Anoa'i. After a recap of last week, Charlotte Flair is in the ring for a promo. Charlotte says she is losing her patience waiting for word from authority figures Daniel Bryan and Shane McMahon. She wants them to grant her a title shot since jumping to SmackDown. "Maybe they're binge watching Fast and the Furious," Charlotte sarcastically said. "Well, I'm fastly getting furious." Clever. She warned they will face her fury if she does not get a title match. SmackDown Women's Champion Naomi interrupted her pity party. She confronted Charlotte and wanted to grant her a title match. Naomi then attacked Charlotte and a brawl ensued. Cue the "Here Comes the Money" theme song. Shane McMahon breaks up the brawl with just his presence. Shane booked a non-title match between the two women. If Charlotte wins, she gets a title shot. In a backstage skit after a commercial, Shane is talking to Natalya. She is upset Charlotte is getting an opportunity for a title match before her. Shane said all she had to do was ask like Charlotte just did. So, it's apparently that easy. Carmella, along with James Ellsworth in tow, joined the scene. Carmella too is upset Charlotte is getting a title shot before her. Ellsworth said she deserved one before anyone. Tamina joined the debate and everybody talked at once. Then, Natalya said she had a plan, and everybody left with her except Shane. 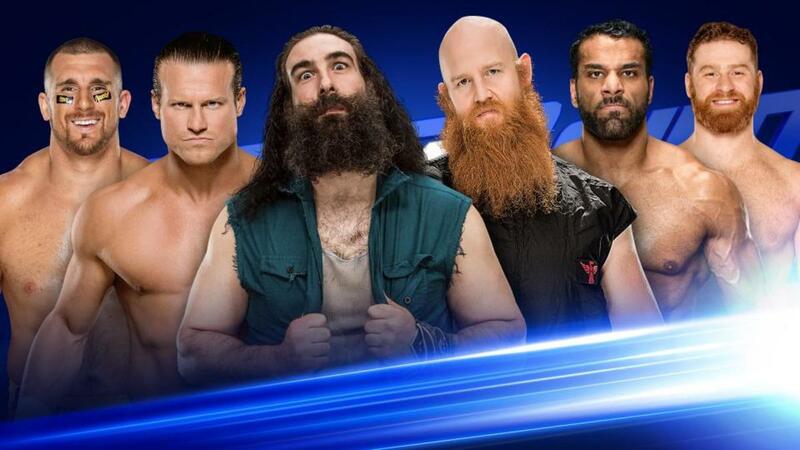 Besides Mahal, the match also involved Sami Zayn, Dolph Ziggler, Erick Rowan, Luke Harper and Mojo Rawley. The one fall match started as a melee and continued as such for several minutes. They fought each other in the ring and on the floor in a free-for-all. The brawl built to Harper doing a tope suicida. Ziggler went for a dive of his own, but Rowan cut him down with a spin kick. Rowan then powerbombed Ziggler of the ring to the floor onto everybody else. Zayn also did a slingshot moonsault to the floor. Then the match settled into them taking turns going one-on-one in the ring. Zayn was running wild on Mahal when two unknown men at ringside grabbed Zayn by the feet to cut off his momentum. The two men were later identified as the Bollywood Boyz. The distraction allowed Mahal to first apply a Cobra clutch, then he lifted Zayn off his feet to slam him down. Mahal pinned Zayn to earn a WWE title shot at Backlash. Afterwards, Renee Young interviewed Mahal in the ring. The crowd showered Mahal with boos. He cut a promo on them for booing him, briefly touching on issues of race and stereotypes. After the promo, WWE Champion Randy Orton walked onstage to confront his new challenger. Orton began cutting a promo on Mahal when Bray Wyatt's mystic powers took over the broadcast. Wyatt threatened Orton in a creepy promo pre-tape promo about the House of Horrors. Wyatt must have a tremendous post-production guy in his family. A video package highlighted Shinsuke Nakamura. It was a beautiful thing, YeaOh! In a backstage interview, Renee Young asked AJ Styles whether he wanted to face Chris Jericho or Kevin Owens in a US title match. Styles said it didn't matter because he has home field advantage on SmackDown. Baron Corbin interrupted the interview. He had words with Styles, leading Styles to challenge him to a match for later tonight. Natalya and the squad she gathered earlier stood in Charlotte's path backstage as she was heading to the ring. They eventually let her pass, but all of the them gave Charlotte the stink eye as she walked by. Charlotte pinned Naomi after Natural Selection. Naomi looked strong in the closing minutes with her getting plenty of offense and near falls towards the end. She seemingly had Charlotte reeling when Charlotte blocked an attempt by Naomi at the Rear View. Charlotte then used her finisher to score the pin. Natalya and her squad watched the match on a monitor backstage. Later on, Charlotte walked past them again, giving a "wooo" as she past. In some cross-promotion business with USA Network, the hosts of the new show "Team Ninja Warrior" were ringside promoting the show's debut tonight after SmackDown. Epico and Primo worked over Chad Gable until a hot tag to Jason Jordan. On a sunset flip, Primo kicked Jordan so Epico could roll him up for the pinfall. Thankfully, the Shining Stars gimmick seems done and the Colons are being pushed as a more serious team. The announcers put them over as being from a famed wrestling family. Another teaser aired hyping the arrival of Lana. Previously she was doing the Emmalina gimmick. This week she was doing the Kelly Kelly gimmick from the early days of the ECW relaunch doing a provocative chair dance. A video package highlighted Tye Dillinger. After it played, Dillinger said the promo was a perfect 10. Owens first cut a promo saying he was the champion of the United States. He paused, then added he was from Canada. The crowd booed. He asked his challenger to introduce himself. The challenger said he was Gary Gandy, and added he was from Louisville for the hometown pop. Owens quickly squashed Gandy, then delivered a pop-up powerbomb for the pin. After the quick match, Owens cut another promo saying as long as he hold the US title he will be the "Face of America" as that is his new heel tagline. Owens added no one could stop him. Owens said he was joining commentary for the next match. He ended his promo by speaking in French. Styles was playing cat-and-mouse with Corbin before getting caught and thrown into a ring post. Corbin worked over Styles and grounded him. Styles fought back only to get posted a second time. Moments later, Corbin played charging bull as Styles was the matador. Styles moved out of the way for Corbin himself to hit the ring post. Styles went into his comeback, hitting a flurry of moves. Styles hit a flying forearm for a near fall. Corbin cut off the comeback and executed a backbreaker for a near fall. Styles transitioned into applying the Calf Crusher. Corbin got a rope break, and followed up by delivering Deep Six for another near fall. Styles countered by sending Corbin to the outside. Styles hooked Corbin and glared at Owens at the broadcast booth. Corbin backdropped Styles onto Owens. Heading into the finish, Corbin tried to capitalize only for Styles to counter with an enzuigiri at ringside. Styles followed that by leaping off the steps for a his signature forearm smash. Styles rushed back into the ring and Corbin was unable to answer the count. Styles won via count-out to retain his spot as the next challenger for the US title. WWE Fastlane preview: Will AJ Styles survive the six-pack challenge?